Angelo Secchi is considered the founder of Stellar Astrophysics as he introduced one of the spectral classifications of stars, used as reference for the subsequent classifications which are at the basis of those employed nowadays in astrophysics. His studies opened the way to modern research on stellar atmospheres and allowed the understanding of stellar evolution. He was also one of the first scientists to study the spectra of comets and the very first to observe the spectrum of the planet Uranus. He is also one of the founders of solar physics in view of his studies on the solar photosphere and chromospheres which allowed him to analyze the characteristics of the sunspot activity and to identify the solar prominences as features of the sun itself. He wrote important books like Le Soleil (1870 and 1875-77) and Le Stelle (The stars, 1877). He authored a noteworthy volume in 1864, Sulla Unitá delle Forze Fisiche (On the Unity of Physical Forces) which had an extraordinary success in terms of editions and translations and gave a significant contribution to the spreading of the most advanced theories of physics at that time. These were overcoming the Aristotelian view which was still supported by the most conservative part of the catholic culture. 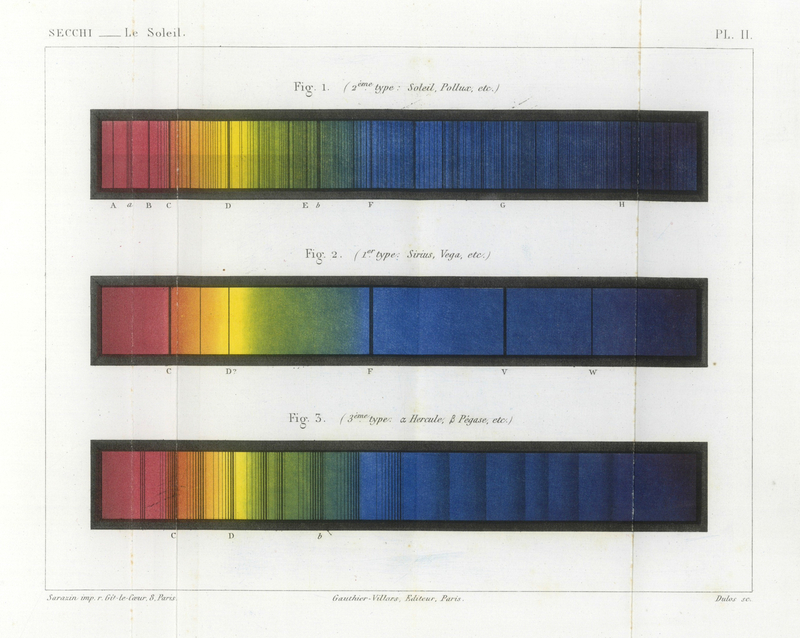 Reproduction of a Table from Le Soleil which shows three different stellar spectra corresponding to three distinct classes of stars in the first spectral classification devised by Angelo Secchi. Nowadays, the profound differences of the spectral lines in terms of intensity and number are known to be due to temperature and gravity at the stellar surface. Secchi believed in the unity of science and constantly tried to find the connection between the solar phenomena and the meteorological and geomagnetic ones by means of intense monitoring and data recording activities. Secchi always compared and cross-checked data and gave priority to observed phenomena as he preferred the experimental approach with respect to theories and calculations, This method of conducting advanced research and his contributions to dissemination of science were often challenged, but make him a very modern scientist. 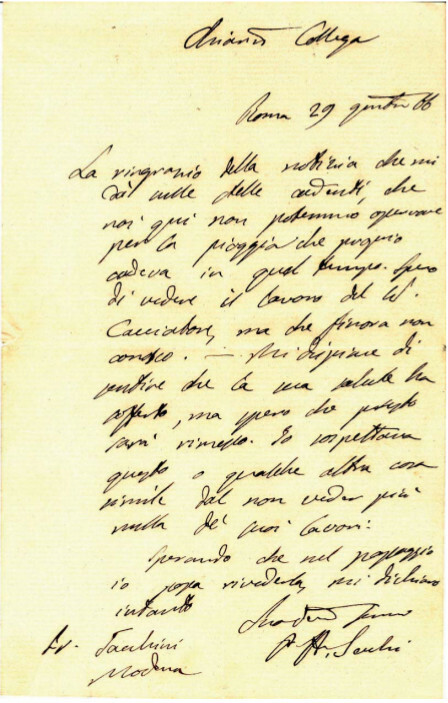 Worth mentioning – besides the already cited contributions to meteorology (the realization of the first modern governmental weather warning and forecast Service in history, the transmission of the data by telegraph, and the invention of the ‘meteorograph’) and to geodesy (measurement of the geodetic basis on the Appian Way, construction of a tower on top of Monte Mario for the geodetic triangulation of the Papal State and for the measurement of the degree of the central European meridian) – is a contribution to limnology by introduction of a disk, the Secchi disk, which is still in use for the measurement of water transparency.